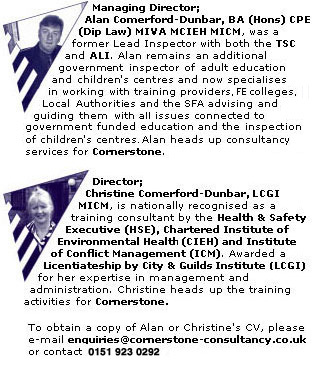 Cornerstone was formed in 1999, both of its directors are experienced managers within the training world. Both are fully aware of the need to maintain sound administrative and quality assurance systems. The company maintains a firm control of quality assurance issues, especially when using sub-contracted trainers and consultants. Regular reviews of the standard of their work are carried out. Cornerstone will only exist and continue to grow if it provides a quality service. The directors, therefore, carry out a comprehensive review of all company practices at least twice a year. All trainers and consultants are systematically observed and receive constructive feedback on their performance in order to maintain the high standards that the directors expect of their staff.